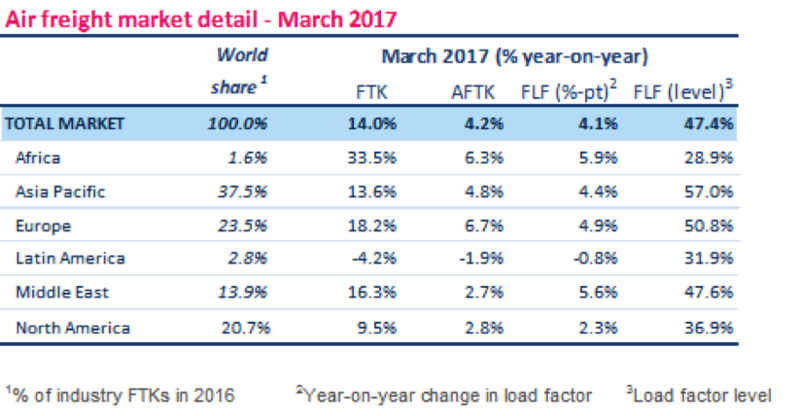 The International Air Transport Association (IATA) released March 2017 demand growth results for global air freight markets showing a 14% expansion measured in freight tonne kilometers (FTKs) compared to the same period last year. This was the fastest pace of growth recorded since October 2010. Freight capacity, measured in available freight tonne kilometers (AFTKs), grew by 4.2% year-on-year in March 2017. March performance contributed to very strong first quarter (Q1) growth in freight volumes. After adjusting for the impact of the leap year in 2016, freight demand in Q1 2017 increased by nearly 11%. Capacity increased by 3.7% over the same period (leap year adjusted). The strengthening of air freight demand in March is consistent with an uptick in world trade and a six-year high in new export orders. An increase in the shipment of silicon materials typically used in high-value consumer electronics shipped by air, is also likely underpinning a portion of the strong performance. “March capped a robust first quarter with the strongest year-on-year air freight growth in six-and-a-half years. Optimism is returning to the industry as the business stabilizes after many years in the doldrums. There is, however, still much lost ground to recover while facing the dual headwinds of rising fuel and labor costs. It remains critical to use the improvement in the industry’s fortunes as an opportunity to enhance the value offering by implementing modern customer-centric initiatives that streamline processes and reduce costs,” said Alexandre de Juniac, IATA’s Director General and CEO. All regions, with the exception of Latin America, reported year-on-year increases in demand in March 2017. Airlines in Europe and Asia-Pacific posted the strongest growth accounting for two-thirds of the industry-wide increase in demand. The remaining growth was split between North American and Middle Eastern carriers, with African airlines making a modest contribution. Asia-Pacific airlines’ freight volumes expanded 13.6% in March 2017 compared to the same period a year earlier and capacity increased by 4.8%. The increase in volumes reflects the strength of the order books reported by exporters across the region. Seasonally-adjusted volumes increased in March and are now back to levels reached in 2010 during the post-global financial crisis bounce-back. Demand has strengthened considerably on all key routes to and from Asia over the last six months with the exception of Pacific routes (Asia to North America). North American carriers posted an increase in freight volumes of 9.5% in March 2017, and a capacity increase of 2.8%. International freight volumes increased 14.2% over the same period – the fastest pace since the boost to air freight from the consequences of congestion at US West Coast seaports in 2015. Seasonally-adjusted volumes have slowed to a near standstill alongside a weakening in demand in Pacific routes. The further strengthening of the US dollar continues to boost the inbound freight market but is keeping the export market under pressure. European airlines posted an 18.2% increase in freight volumes in March 2017 and a capacity increase of 6.7%. International freight volumes grew by 18.1% year-on-year, the fastest pace in six years. Seasonally-adjusted freight volumes continue to trend upwards. The ongoing weakness of the Euro persists in boosting the performance of the European freight market which has benefitted from strong export orders over the last few months. Middle Eastern carriers’ year-on-year freight volumes increased 16.3% in March 2017 and capacity increased 2.7%. International freight volumes increased 16.4% year-on-year in March – the fastest pace since June 2015. Seasonally-adjusted freight volumes maintained their upward trend. The year-on-year growth rate has recovered after having moderated in late-2015 and is now back in line with the long-run average. Demand remains strong between the Middle East and Europe but traffic to Asia has weakened. Latin American airlines experienced a contraction in demand of 4.2% in March 2017 compared to the same period in 2016. Capacity decreased by 1.9% over the same period. Freight volumes have now been in contractionary territory in 26 out of the last 28 months. Recovery in seasonally-adjusted volumes also stalled with demand in March reaching its lowest level since October 2010. Demand is now 18% lower than at the peak in 2014. The region’s carriers have managed to adjust capacity, which has limited the negative impact on the load factor. African carriers’ posted the largest year-on-year increase in demand of all regions in March 2017 with freight volumes growing 33.5%. Capacity increased by 6.3% over the same time. Demand has been boosted by very strong growth on the trade lanes to and from Asia following an increase in direct services between the continents. The increase in demand has helped the region’s load factor rise by 6 percentage points compared to March 2016.